Air conditioners can consume an incredible amount of power. Between the electricity the compressor utilizes and the torque of the motor in order to spin the fan, your electric bill can skyrocket over the summer. In order to reduce the cost of this unit, some have installed solar panels onto the roof specific to the sole use of the AC device. However, innovative designs have made development of these units far more elaborate than in previous years. Mobile Cooling – Many people like the idea of being able to maneuver a cooling device set on wheels in order to maximize the effect in any given room. 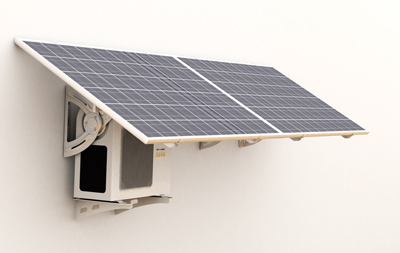 Developers have created a small unit that can be rolled across the floor while being connected to a solar panel. With some of these smaller units, you can essentially place the panel in the window as long as the sun’s light can reach. These can be incredibly useful if you need a solution that can travel with you from one room to the next. Ductless Heat Pump Units – Operating at 18,000 BTU, some of these ductless heat pump units can reduce power consumption by nearly 97-percent. Solar panels as well as the mini-split design allows for installation nearly anywhere. Once the sun light is minimal, the heat pump automatically switches to an energy efficient device taking its power from the grid. Although some of these are not 100-percent dependent on solar power or battery backups, the units can still reduce your day-time spending per kilowatt hour. Hybrid Heating and AC – Some units have been developed to act as both air conditioning and as heaters in order to keep rooms comfortable year round. Although this isn’t necessarily a new idea, the addition of solar power to operate these units decreases your spending regardless of season changes. Some of these miniature HVAC systems can range from small 5,000 BTU devices to more powerful machines producing more than 40,000 BTUs. Depending on your own room requirements, hybrid systems can keep you cool in the summer and warm in the winter while using less power from the grid. Central Air – Central air is an efficient method of keeping the home cool in the summer. Solar power adaptations have been created that can operate in a hybrid unit offering cool air as well as heat. Using energy efficient technology and including its own dedicated solar panel, these units are far less costly to maintain than the gird-dedicated counterparts of the past. Do it Yourself Projects – If you can’t find something that fits your budget or your specific needs, you can always build one yourself. There are many different ways that these units can be assembled – most of them using upcycled parts from various machines. Your own imagination and skills with a soldering iron will play a role in how elaborate you make your own solar AC unit. You may even design something that is marketable to make a few extra dollars. With each passing year, an innovative method is developed to include solar energy. Air conditioners, outdoor camping showers, ovens, toys, boat engines and more have been adapted to utilize one of the most abundant sources of power humankind has discovered. What was once an expensive addition for the upper class has decreased in cost to the point where nearly everyone can benefit in one form or another from solar energy. Imagine what will be developed tomorrow.